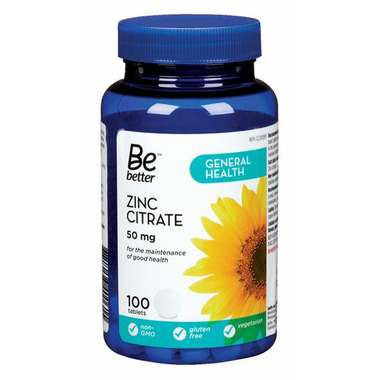 The Be Better Zinc Citrate is a gelatin free, dye free, and vegetarian supplement for the maintenance of general health. Dosage: 1 tablet daily with a meal, a few hours before or after taking other medications, or as recommended by a physician. Ingredients: 50mg Zinc (citrate) per dose, Microcrystalline cellulose, magnesium stearate. Zinc supplementation may cause a copper deficiency.